This year’s New York Benefit: Headlines & Headliners will feature a live performance by a cast member of the Tony Award-Winning musical, “Fun Home,” based on the best-selling graphic memoir by Alison Bechdel. In 2015, Bechdel was inducted into NLGJA’s Hall of Fame. Bechdel won the 2015 Tony Award for the musical adaptation of Fun Home. She was honored with a prestigious Guggenheim Fellowship in 2012 and a MacArthur “Genius Grant” in 2014. We’re happy to welcome Alessandra Baldacchino to Headlines & Headliners performing Fun Home’s signature musical number Ring of Keys. 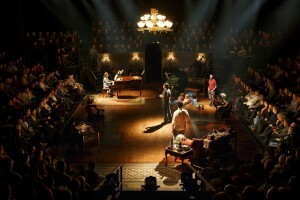 The Fun Home musical is driven by the protagonist Alison and her uniquely dysfunctional family. Audiences explore Alison family relationships through revealing memories of her mother, brother and capricious, brilliant, enigmatic father.